Mercedes-Benz SL Pros and Cons | Page 1 of 1 | Why Not This Car? What drives people to buy (or not buy) a certain car? 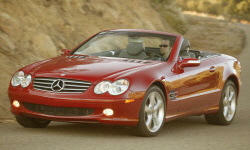 TrueDelta's members share Mercedes-Benz SL pros and cons based on their real-world driving experiences. Too expensive to repair when warranty expires. Probably wouldn't purchase another one, although an all-around fabulous car. The r129 Benz is the ideal sports car for fat middle aged men like me who appreciate fine German automobiles, want wind in their hair, and are willing to put up with the hassles that come with ownership of a beautiful diva.